I read an article from Forbes magazine a few weeks ago about health and the changing demographics of today’s consumers. In Older Consumers: Redefining Health and Wellness As They Age, it mentioned the social and economic implications of an aging population should be of “significant interest to food and beverage industry marketers.” That’s Bernick's! As I read through it, I realized not only are we interested in that research, we’ve positioned ourselves that way for a while now. We continue to strive to bring the changing consumer landscape the healthy, vast choices in food and beverage it desires. One way we’re doing that is with our newly branded line of fresh vending items – EATS. The food and beverage industry is no stranger to fads and changing trends – for example, for the first time in history, water has surpassed soda as the largest beverage category by volume in the U.S. We know a thing or two about changing consumer habits and demographics. But the focus on health isn’t going anywhere; it’s here to stay. 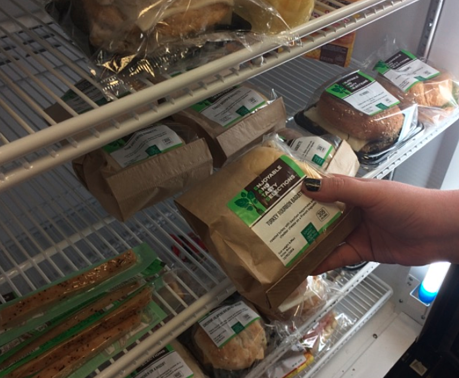 Knowing that we took the initiative to take a look at what we offered particularly in our vending and micro market line that appealed to healthy choices. People can spend up to 10 hours a day away from home or on the run between work, school, hobbies, and other obligations. We studied how people were consuming food on the go, and what convenience they sought out during busy days. The vending machine of today has far evolved past soda, candy bars, and chips. New innovations in equipment have allowed for coolers and cold systems to feature perishable, fresh foods. Now busy people can rely on the convenience and access of vending and micro markets for actual meal items including fresh fruits and vegetables, sandwiches, salads, combo snack platters, and more. We entered that market over 10 years ago, but recently overhauled our line of fresh food to meet the changing needs of today’s health-conscious, busy consumer. Our goal with the new brand was to continue to deliver delicious food to consumers while increasing overall integrity of the products we offer. More and more people are turning packages over before adding them to their cart or lunch trays; we feel good about ingredients and preparation that match their expectations. And, we’ll continue to bring innovation and fresh takes on favorites as a way to foster loyalty while maintaining our position as a true culinary-focused company. While EATS is proprietary to Bernick’s, its access isn’t limited to certain areas or companies. Anyplace where our vending machines or micro markets are present is where you can find our fresh food brand. Adding an onsite option for food and beverages is often a top priority for larger companies and buildings that serve a lot of people. And, ensuring those machines are stocked with the healthy food options people are searching for is even easier if you’re a customer of ours. We take great pride in supplying our communities with great food that is affordable, prepared well, and tastes incredible. Going back to the Forbes article that prompted me to write this blog, it mentions that the changing landscape of consumers will seek out and prefer “food and beverage distinctions like fresh, less processed, local, and real”. The EATS brand of menu items touches on all of those points, which is a nice reinforcement to know that we’re on the right track with our service offerings even if we’ve been focused in that space for a while now. I’m going to leave you with a challenge. The next time you’re in search of quick, accessible food during your busy day, look for our label. Enjoy the handcrafted item and if you want my input, I’d tell you to try the Honey Sriracha Chicken Sandwich.